Most enthusiasts can relate to the drug that is modifying cars. Once you start, it only gets harder to stop. Coming from a background of drag racing his turbo Supra and daily driving large displacement monsters like the C6 Corvette and Dodge Viper, Al Rhee knows the horsepower addiction all too well. 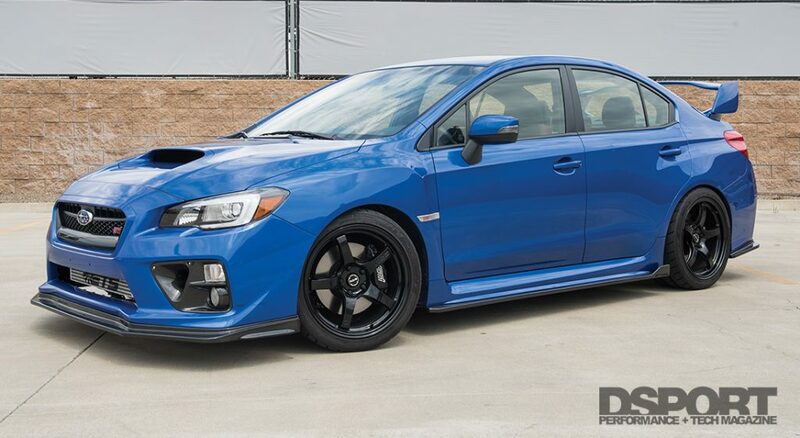 When he acquired his latest daily driver, a 2017 Subaru WRX STI, he knew early on that he’d have to tread carefully when starting this project. Since its introduction to the D’Garage, we’ve tested 13 exhaust systems, upgraded the intake and intercooler, added flex-fuel capabilities, and opened the gates for more fuel flow, among numerous other mods. With the car currently sitting at 369whp and 430 lb-ft of torque, Al decided it’s time to throw in the towel. It’s time to tie up the project with style and handling upgrades to match the power and keep it as his fun yet still somewhat practical street car. In our most recent Test and Tune for the 2017 Subaru WRX STI, we equipped the car with a new intercooler, intake, unequal length header, turbo inlet hose, and blow off valve, among other components. At the end of our last Test and Tune, the car reached 369whp at 5,000 RPM and 430 lb-ft of torque at 4,250 RPM. The broad torque band made the car much more enjoyable to drive around, but also pushed past the limits of the stock clutch. With a Stage 2 South Bend clutch taking place of the factory hardware, Al decided the powertrain has been through enough. Escalating power levels much higher would lead to questionable reliability of the EJ257’s internals in factory form, so priorities shift to further enhancing the car’s handling and looks. 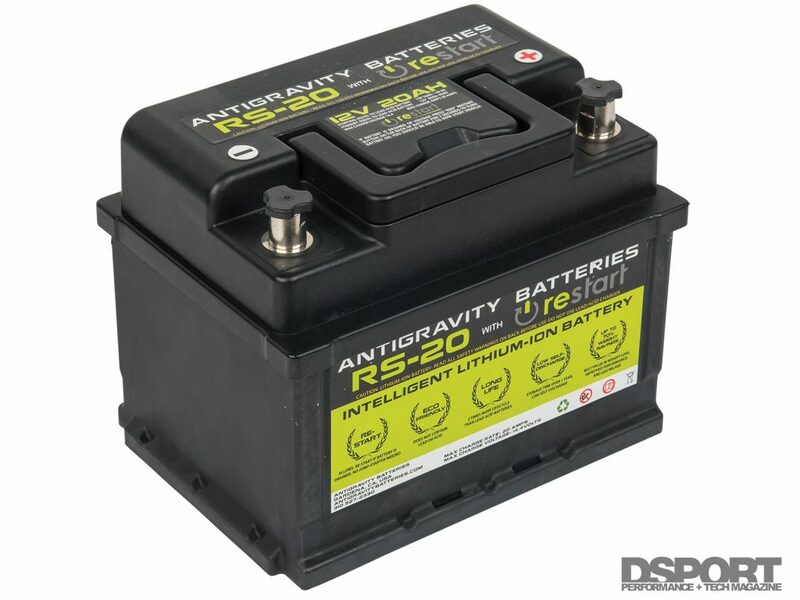 The race-spec Antigravity RS-20 Lithium-Ion battery weighs in at only 10 pounds, cranks out 1,000 amps of starting power and features an automatic low-voltage cut-off that limits discharge. In part 2 of the VAB STI Test and Tune series, we equipped the car with a set of Gram Lights 57CR 18×9.5-inch wheels, wrapped in 265/35R18 Nitto NT05 tires. The larger contact patch on sticky tires let the car carry more speed through corners, calling for improved suspension components. The Bilstein B16 adjustable dampers delivered stiffer spring rates and full control of both compression and rebound characteristics, however, the car still sat on stock sway bars which allowed for excessive lean and slow weight transfers in corners. 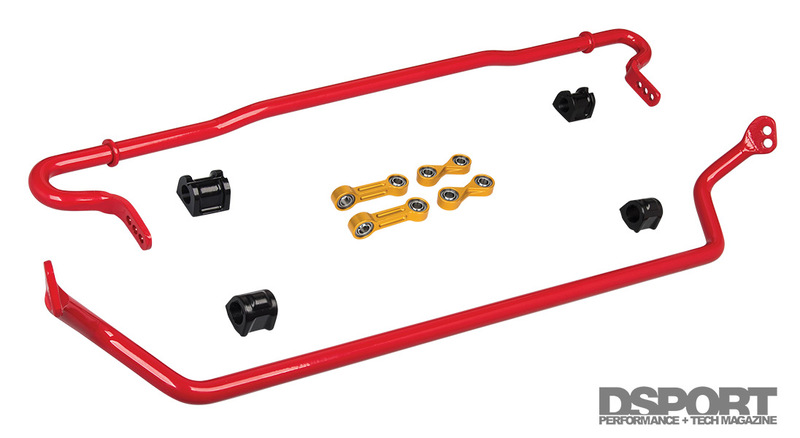 The larger adjustable anti-sway bars reduce the load difference between the inside and outside wheels through increased stiffness over OE bars. A small increase in diameter makes a considerable difference in torsional rigidity. This allows the rear end to rotate with greater effectiveness. In order to take full advantage of these suspension component’s potential ability, we employed Sway-A-Way’s front and rear say bars and endlinks. The 25.4mm front bar offers up to 35 percent extra stiffness over the OEM bar, while the 24mm bar allows for up to 126 percent more stiffness than the original. Why the massive difference on the rear end? 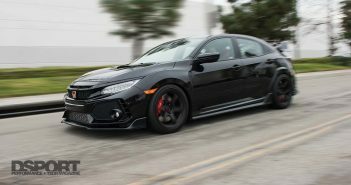 Although the new VA-generation WRX and STI employ a rigid chassis and well-tuned suspension geometries for excellent corner holding, the cars still struggle with understeer and rotation. The stiffer rear bar increases rear roll resistance and thus forces more of the weight being transferred to go to the rear tires when entering a corner. This allows the front tires to hook up to the road better and the rear end to rotate more effectively. 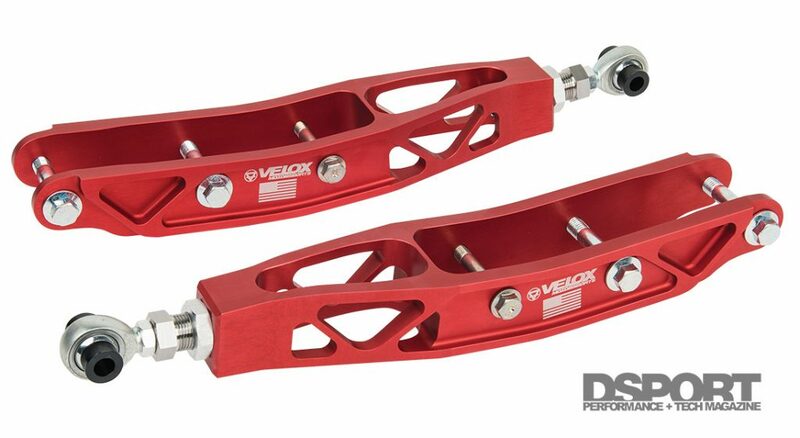 Removing nearly a pound per side of unsprung weight over OE, the Verus Engineering lower control arms are CNC-machined from aluminum with an anodized finish. 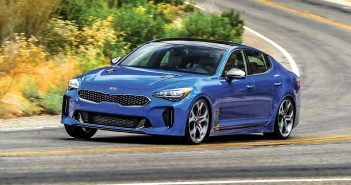 The car’s enhanced handling capabilities make it all the more track-ready and driver-friendly for muscling it around corners. The two-way Bilstein dampers and adjustable sway bars open the door for fine-tuning the car’s handling characteristics from track to track. In order to provide the ability to change camber angles on the fly, we swapped out the rear lower control arms with Verus Engineering’s (formerly Velox Motorsports) WRX 7000 Series Aluminum Lightweight LCA. The 7000 Series LCA design saves a pound on each side and utilizes a heim joint and jam nut to make quick yet precise changes to the rear wheel camber angles. Aside from the Gram Lights 57CR wheels, the D’Garage WRX STI held onto a stock appearance. Given the numerous upgrades that went under the hood and behind the wheels, we decided that a few aero upgrades would benefit the car further in terms of both looks and functionality. We turned to APR Performance for an aero solution in the form of a front air dam, side rocker extensions, rear bumper skirts, and brake cooling ducts. 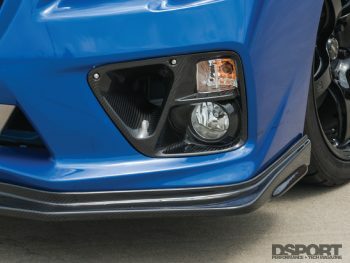 The air dam, rocker extensions, and rear bumper skirts enhance the car’s existing body lines while reducing air pressure underneath for extra downforce. At the front end, the APR Brake Cooling Ducts replace the original fog light panel to open up an aerodynamic funnel to direct air through ducting hoses and onto the brakes. We did find that the cooling ducts happened to collide with the ETS Front Mount Intercooler piping, however, some trimming of the carbon fiber on the APR pieces allowed everything to fit in place. 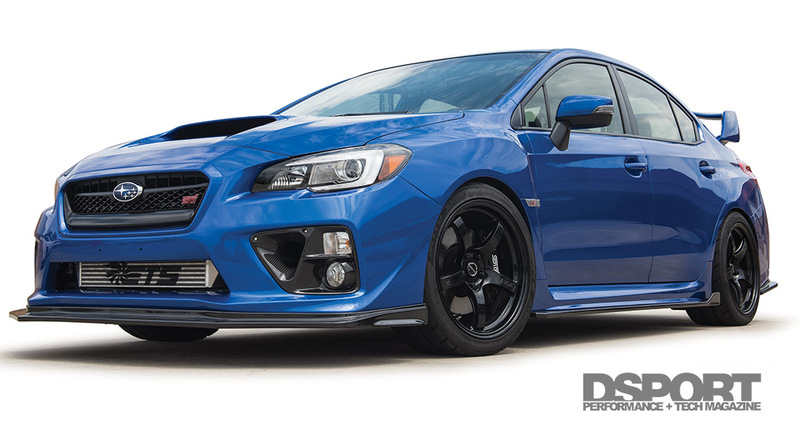 The D’Garage STI now feels more balanced than ever, taking the form of a near 400 horsepower drag toy that performs just as well around twists and turns. The front and rear grip have finally found a neutral personality only slightly biased to a manageable oversteer. This made the car leaps and bounds more capable and fun to drive. Even better, the car’s interior space is untouched and the suspension components lend little detriment to the ride quality. As it stands, the car readily serves double duty to pick up the kids after school or to hit the track on weekends. 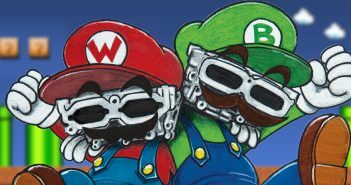 If Al begins to get that modding itch once again, he’ll need to look into an upsized turbocharger since the factory unit is maxed out. Al claims that the car is great as it is and that he sees no need to modify it further. This may be true for now, but our guess is that it won’t be long until the itch comes back.